Shoot blight symptom was found on persimmon (Diospyros kaki) in southern Western Australia in December 2010. The pathogen was isolated and identified as Diaporthe neotheicola on the basis of morphology, sequence analysis of the internal transcribed spacer (ITS) and the translation elongation factor 1-α (TEF). A pathogenicity test was conducted and Koch’s postulates were fulfilled by re-isolation of the fungus from diseased tissues. This is the first report of D. neotheicola causing shoot blight on persimmon in Australia and worldwide. The genus Diaporthe (including Phomopsis) contains a large number of endophytes, saprobes and plant pathogens that cause blights, cankers, die-backs and wilts on a range of plants of economic importance (Uecker 1988; Mostert et al. 2001; Udayanga et al. 2011). Diaporthe neotheicola (synonym Phomopsis theicola) has been reported as a weak pathogen from several hosts, including Aspalathus linearis (van Rensburg et al. 2006), Camellia sinsensis (Uecker 1988), Foeniculum vulgare (Santos and Phillips 2009), Prunus dulcis (Diogo et al. 2010) and Protea, Pyrus, Vitis vinifera (Mostert et al. 2001; van Niekerk et al. 2005). Phomopsis diospyri was reported causing shoot blight and dieback on persimmon in Greece (Thomidis and Navrozidis 2009). In Italy P. mali was reported as the cause of severe dieback of persimmon (Rosciglione 1983). In both cases the identifications of the fungi were not confirmed by molecular methods and the species names utilized should be treated with caution. 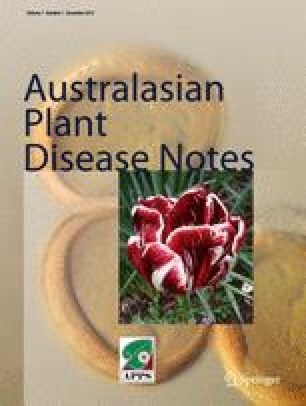 There has been no report, in the scientific literature, of the occurrence of D. neotheicola on persimmon in Australia or elsewhere in the world, although the Australian Plant Disease Database (APDD) includes records of Phomopsis sp. on persimmon from NSW, QLD, VIC and WA. Persimmon is a deciduous tree that has been cultivated in Australia for over 100 years. Japanese cultivars of non-astringent persimmons were introduced into Australia in the 1980s. Persimmon production is spread across the states and Western Australia produces 5 % percent of total production in Australia (PAI. 2009). In December 2010, persimmon plants with shoot blight, twig girdling and wilt symptoms (Fig. 1a) from southern Western Australia were sent to the Department of Agriculture and Food, Plant Diseases Diagnostic lab at South Perth. Severe decline of the persimmon trees has occurred due to loss of blighted shoots and it has become prevalent in the persimmon production areas in southern Western Australia. The disease developed during spring on the current season’s shoots, extended rapidly, disrupted vascular tissue, and caused shoots to wilt in the late spring and early summer. Tissue was excised from the leading edge of stem lesions and surface-sterilised by immersion in a 1.25 % aqueous solution of sodium hypochlorite for 2 min, rinsed in sterile water and dried in a laminar flow cabinet. The pieces were then either (a) placed on potato dextrose agar (PDA) and incubated at 22 ± 3 °C for 7 days, fungal colonies subsequently sub-cultured onto PDA and then single-spored to obtain pure cultures; or (b) placed in trays on moist filter paper and incubated at 25 °C with a 12-h dark and light cycle for 2 weeks. Fungal colonies with similar morphological characteristics were consistently isolated both from agar plates and incubated plant specimens. After 14 d the fungal colonies were cottony white, pale-grey on the reverse side of the agar plates. Conidiomata were globose to subglobose, 360–700 μm in diam. Pycnidia were dark brown, scattered or in groups. Conidiophores cylindrical hyaline 6.5–25 × 1.5–3 μm. Alpha conidia unicellular, guttulate, fusoid with obtuse ends 7–10 × 2.5–4 μm. Beta conidia hyaline, aseptate, filiform curved with rounded ends 23–30 × 1.2–1.5 (Fig. 2). Some pycnidia produced only one type of conidia. Pycnidia were embedded in the stem tissues, sub-epidermal scattered with a short neck protruding to the surface (Fig. 1b). Both cultural and morphological characteristics of the fungal isolates were similar to those described for D. neotheicola (Santos and Phillips 2009). Representative isolates were deposited in the Western Australia Plant Pathogen Collection (WAC13427) and the Queensland Plant Pathology Herbarium (BRIP 54603). Two representative isolates identified as D. neotheicola were grown on PDA for 2 weeks at 25 °C. DNA was extracted from fungal mycelium with the Gentra Puregene kit (Qiagen, Melbourne, Vic., Australia) according to the manufacturer’s instructions. PCR amplification was conducted using the Phusion High-Fidelity PCR Master Mix (Finnzymes, Espoo, Finland), which consisted of 12.5 μL of 2 x Master Mix with HF Buffer, 0.5 μL each of 10 mM of forward and reverse primers, and 1 μL of DNA template. The internal transcribed spacer (ITS) region was amplified with primers ITS1 and ITS4 (White et al. 1990), and part of the translation elongation factor 1-α (TEF) was amplified with primers EF1-728 F (Carbone & Kohn 1999) and EF2 (O’Donnell et al. 1998). PCR products were amplified in a Bio-Rad C1000 thermal cycler (Bio-Rad Laboratories, Hercules, California, USA) using the following conditions: 98 °C for 30 s, 30 cycles at 98 °C for 10s, 55 °C for 30 s, 72 °C for 30 s, followed by a 5 min final extension at 72 °C. The products were sequenced by Macrogen Incorporated (Seoul, Korea) using the AB 3730xl DNA Analyser (Applied Biosystems, Forster City, California, USA). The ITS and TEF sequences of BRIP 54603 (GenBank accession JQ809272 and JQ809273, respectively) are identical to the ex-type culture of D. neotheicola CBS 123208 (EU814480 and GQ250315). A pathogenicity test was carried out on 3 year old persimmon plants in the glasshouse. Two representative isolates of D. neotheicola (14-d-old cultures) were used for inoculation of wounded and non-wounded shoots. The shoots were trimmed to a uniform length of 30 cm. A single wound was made in each of the shoots by pin-prinking them with a syringe needle. One mycelial plug (5 mm in diam.) was placed on each wound. Mycelial plugs were fixed onto the wound sites with parafilm to prevent contamination and desiccation, and then removed after 7 day. Agar plugs without fungal colonies were placed on wounded and non-wounded branches of plants, serving as controls. Inoculated plants were placed in the glasshouse at 25 °C and a 12-h dark and light cycle. After 3 weeks disease symptoms were identical to those seen on naturally infected plants. The symptom development was accelerated on wound-inoculated compared with non-wound inoculated shoots. Controls remained asymptomatic. Koch’s postulates were fulfilled by re-isolation of D. neotheicola. This fungus was hence shown to be pathogenic to persimmon causing shoot blight. The identity of D. neotheicola was confirmed by morphology and DNA sequence data. To our knowledge, this is the first report of D. neotheicola causing shoot blight on persimmon in Australia and worldwide. The authors would like to thank Ms Nuccia Eyres and Ms Christine Wood for providing information and technical assistance. PAI. 2009. Persimmon Australia Incorporated. Available online at <http://www.persimmonsaustralia.com.au/newsstory2.html>.